In 1994 a small tornado hit the town of Cross Plains. Because of the damage it caused to the roof of the Howard House, Howard Days was cancelled for that year. The storm also destroyed the Butler house located next door to the Howard place and because of that, Project Pride wisely decided to erect an outdoor pavilion in its place. The Alla Ray Morris Pavilion, named for the one-time owners of the REH literary estate, is an open-air, roof-covered concrete slab adjacent to the Robert E. Howard Museum. During the second weekend in June, it is Howard Days Central. 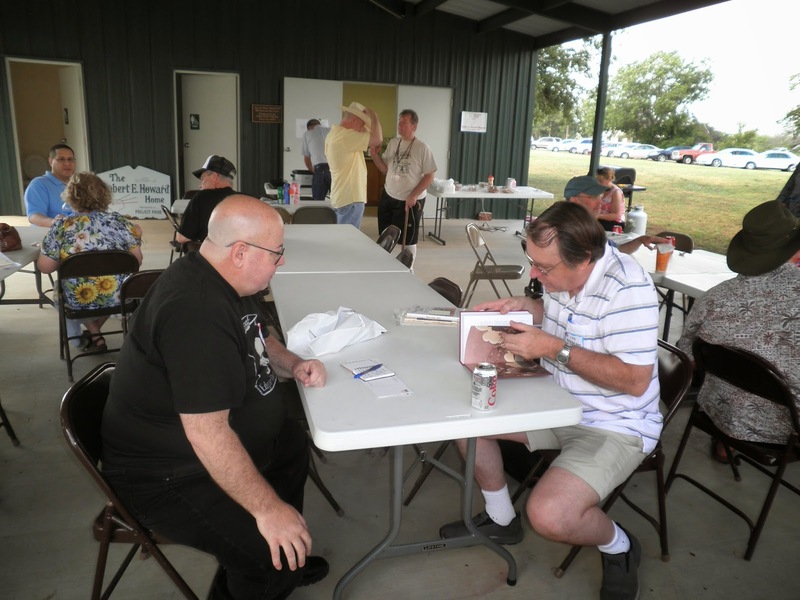 The Pavilion is the gathering place for all who come to Robert E. Howard Days. It will be open and available most of the day on Thursday and 24 hours Friday and Saturday. As you can see, tables and chairs are set up for all visitors to relax, converse with old and new friends and simply share in the fellowship of the like-minded souls who come to Howard Days to honor the Legacy of Bob Howard. There are restrooms too, along with a small kitchen and the grounds surrounding the Pavilion are nicely shaded for relaxing or a picnic lunch. The Friday morning Bus Tour begins here - it starts at 9 am sharp, so plan on being at the Pavilion a little early. The final panel on Saturday is also held here. The Swap Meet takes place here also - you are invited to please take a little bit of space and display any Robert E. Howard type items. The only payment we ask for the space is a 10% of what you sell donation to Project Pride. The Robert E. Howard Foundation Press will also have their REH books for sale here in the Pavilion and I'm sure Featured Guest Tom Gianni will be happy to sign the books he's done cover paintings for! So, if you have any questions during your visit to Howard Days, most certainly there will be someone in the Pavilion to help answer them. Without a doubt it is the friendliest spot at Howard Days. Hope to see you at the Pavilion! The photo above shows the ample parking on the west side of the lot and there is also parking on the east side street.